One of my saving graces at Grossmont Center is its food court. With its kid-friendly fare and open space, I know I can eat without getting the stink eye from fellow diners. By the time my husband, Derek, and I finally had our daughter, we were eight years into our marriage. We had been to great restaurants and had fine dining experiences. Perhaps most important is we knew what it was like to relax during a meal. One of my favorite memories is walking to Café Chloe in downtown San Diego for Sunday brunch and sipping my mocha while we watched the passersby’s. After we had Quinn, we tried a few times to go out to upscale restaurants only to realize how impossible it was for both of us to enjoy a warm meal. If Quinn wasn’t getting squirrely and needing to be taken outside, she was letting me know she had to go to the potty, which was at least a 10-minute ordeal. Conveniently, she only wanted to go to the potty after our dinners had arrived. Eventually, however, Quinn got old enough to understand her parents wanted to eat the food when it came and adjusted her bathroom practices accordingly. Again, we were able to go to a reasonably nice restaurant and enjoy unique dishes prepared by skilled chefs. And then we had Deacon. Three-year-old Deacon is a different animal when it comes to dining out. As soon as he sits at the table, he takes out the crayons — if a restaurant offers them to kids — and creates either a red, blue or green blob before saying, “Blargh!” and pushing them away from his area. Once the meal comes, one of his favorite things to do is try everything on his plate and, unless it’s a cookie, chicken nuggets or French fries, spit it out onto his plate in full view of everyone around him. Deacon also likes to grab the electronic distract-your-child gadget — a.k.a. our iPhones — and blast “Finger Family” for neighboring patrons who never knew their meals were missing the perfect toddler soundtrack. Finally, after spitting out several bites and blasting “Chicka Chicka Boom Boom” for anyone within a two-table radius, Deacon will fidget and announce, “I’m done, I’m done, I’m done! Let’s go! I wanna go! I’m do-o-o-o-ne.” He will repeat this every few minutes until we defeatedly box up our food to go. Because of this, Derek and I try to take turns sitting with Deacon when we go out. We know one of us will have to sacrifice any culinary enjoyment to ensure we don’t become “that family” to the restaurant. Thankfully, many restaurants in La Mesa are Deacon-friendly. Other families have shared empathetic looks as we beg our kids to “please, just take one more bite” so we won’t feel like we just flushed eight bucks down the toilet. One of Deacon’s go-to hot spots is the food court at Grossmont Center. Although he likes the fries at BFF’s and the smoothies from the always happy Pholicious, his No. 1 pick is Tasty Inn Express. Owner Winnie Mui is always smiling when we see her. 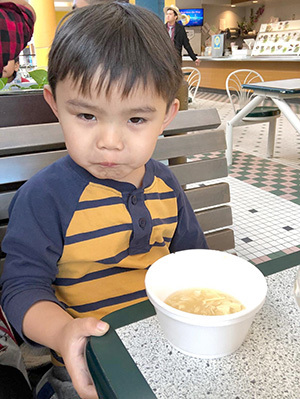 She knows Deacon pretty well by now and is fully aware he is among her biggest fans when it comes to the egg flower soup. Deacon’s reverence for this soup is almost funny. When it first comes, he begs for me to cool each spoonful. Once it’s easier to eat, he practically pushes me aside to spoon and slurp it up himself. He’s even eaten two bowls at one sitting, which is a huge feat for a kid whose attention span is usually limited to five-minute intervals. The food court’s high ceilings allow for any random Deacon noises to disappear amid other sounds, which means no one is giving me the eye because “I am a Pizza” is playing for the fourth time in a row. The best thing about this magical egg flower soup is it allows me to enjoy my own favorite, Beef Chow Fun. As Deacon gets older, I’ve noticed I’m getting to take a little longer with my meals. The other day I was even able to eat lobster ravioli without having to wolf down each bite without chewing. Someday I’m sure I will be able to once again indulge in a nice sit-down dinner with Deacon and Quinn. Ironically, it’s also likely I will miss these days, when my little son wanted me by his side while playing his toddler tunes.